Mortgage rates continue to stay below four percent, allowing cheap financing opportunities among homebuyers. This also strikes a large effort for current homeowners to start a mortgage refinance. As always, depending on your loan type, your rate will vary. Mortgage applicants looking at VA loans will find lower rates for them rather than a comparable FHA or Conventional mortgage loan. For the 12th straight month, VA loans have provided the lowest rates of all available loan types to buyers in the market. In comparison, Conventional loans currently have been holding the highest. For mortgage applicants in search of the lowest rates, than is no better place to look than at VA loans. For the month of April, the average VA loan was 32 basis points or 0.32% lower than the average mortgage rate for all closed conventional loans. The VA mortgage rates averaged at a low 3.83%. The next closest rate to the VA was the Federal Housing Administration loan (FHA). In April, FHA closed loans averaged just below four percent at 3.99%. This marks the third month in a row that a typical FHA loan closed at a rate below four percent. As well as FHA remaining below four percent, there is still more good news for FHA loan applicants. FHA recently reduced its mortgage insurance premiums (MIP). The rates have never been lower on “effective FHA mortgage rates. It has never been cheaper to buy or refinance a home. Furthermore, FHA mortgage rates continue to beat conventional rates on buying and refinancing homes. In April, Conventional mortgage rates averaged 4.15%, about 9/10 of a percentage point above the average rate of all loans closed combined. 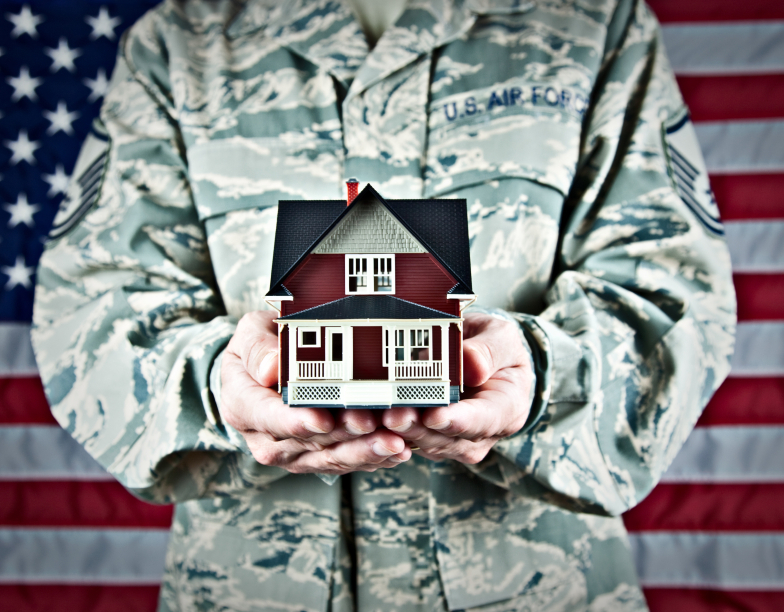 VA mortgage rates are available to eligible military borrowers as part of the VA Loan Guaranty Program. The VA Loan Guaranty Program is 70 years old and is backed by the Department of Veteran Affairs. The program can be used for purchase or refinance of homes. The department also guarantees VA loans against loss, which helps to allow mortgage lenders to provide lower mortgage rates to applicants. Aside from lower rates, there are other benefits to VA loans. VA loans allow for 100% financing. This is saying that no down payment is required with a VA loan, and mortgage insurance is never required. The next benefit to VA loans is that they are assumable. This means that a home can be sold with VA financing “attached” to it. This can be a large selling point given today’s low mortgage rates. If you lock in a VA mortgage rate at around 3.5%, the buyer of your home can maintain this rate even if rates are currently 10% higher. Other benefits of VA loans consist of loose underwriting standards and access to the VA Streamline Refinance, which is one of the fastest and simplest mortgage refinance programs available in today’s market. It is not just VA mortgage rates that are low; mortgage rates are low for all types of loans. Since the beginning of 2014, mortgage rates have been on a steady decline. Home affordability has been boosted by this decline, and put millions of existing homeowners “in the money” to refinance. If you recall, this was not the prediction coming out of 2013. At the close of 2013, the Federal Reserve announced that it would wind down its third round of quantitative easing. Wall Street expected this move to raise mortgage rates, until it was discovered that the Fed had purchased $40 billion of mortgage-backed securities. Without those purchases, analysts thought that rates would rise as demand for MBS dropped. The reverse occurred, actually. Rates dropped instead of rising. Worse-than-expected economic data combined with new geopolitical risks last year to stoke a trading pattern known as “safe haven buying”, which is characterized by investors seeking safety of principal during periods of uncertainty. Mortgage-backed bonds are among the safest of all asset classes, demand for MBS stayed strong. An influx of new investors replaced the Fed’s presence in mortgages and then some, holding mortgage rates down. Today, demand for mortgage bonds remains elevated and rates are firmly fixed beneath four percent — it’s been seven months since rates were north of 4. It’s an excellent time to compare mortgage rates.